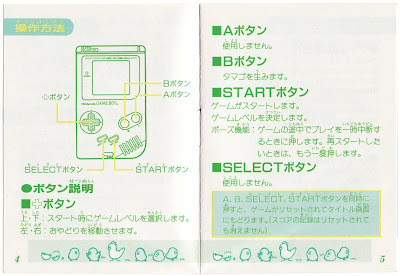 You may remember how, in my last GameBoy-centric "Manual Stimulation" post, I mentioned that belatedly discovering Irem's Noobow back in 2013 almost singlehandedly reignited my interest in Nintendo's first portable game system. 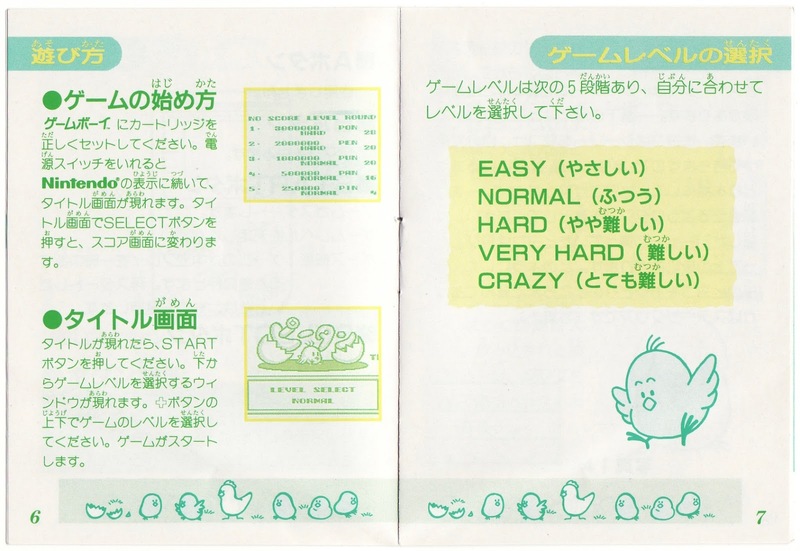 The key words there are "almost singlehandedly," as although that side-scrolling puzzler was the game that got me thinking about the GameBoy again (after more than a decade of completely ignoring it), a number of other titles kept the proverbial ball rolling and even helped it pick up speed. 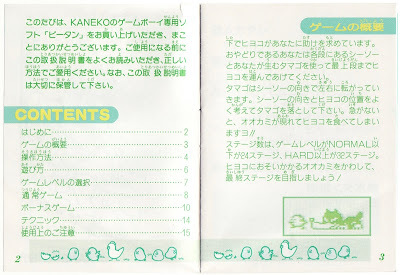 Kaneko's Peetan, highlighted here, is one of those titles. 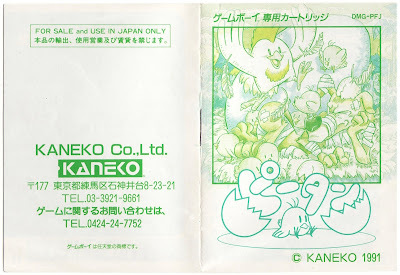 Of course, only a person with a heart of stone could fail to fall in love with a game that comes in such a wonderfully colorful and charming package, don't you think? 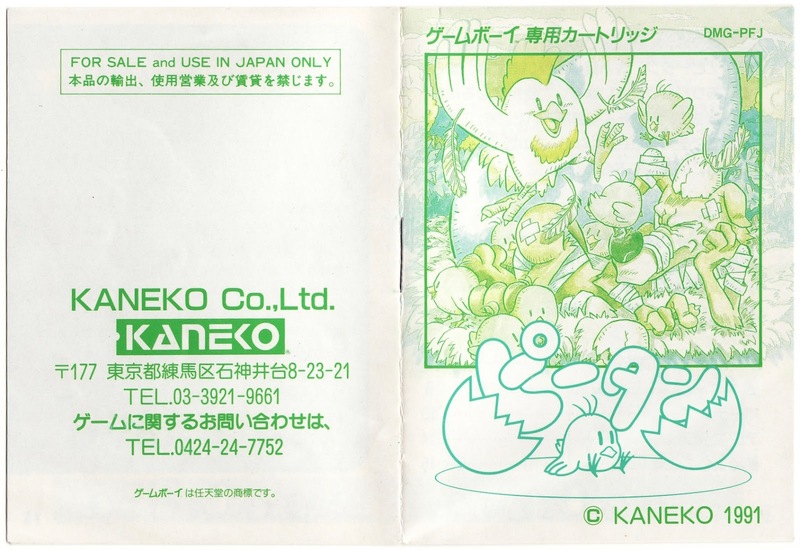 Add in the fact that Peetan's protagonist is a protective mother hen and that its gameplay revolves around launching her endangered chicks to the upper-reaches of a tree, and it should be easy to see how I quickly became smitten with this Japan-only release from 1991. 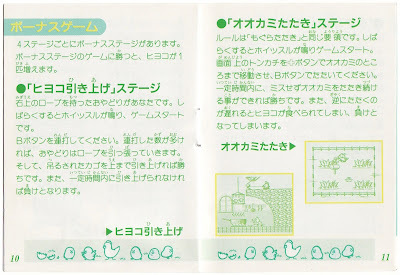 Am I as smitten with Peetan's instruction manual as I am with its gameplay, premise, and packaging? Not really, but don't take that to mean I think it's a dog. 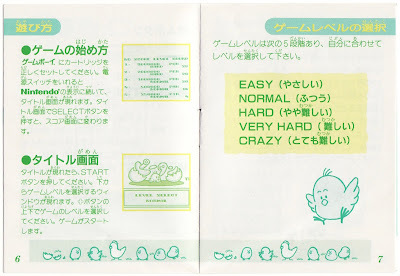 After all, it offers up a number of nice touches. 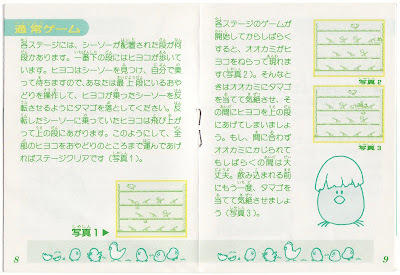 The line of illustrated chicks that runs along the bottom of every page is a good example. The larger drawings that pop up here and there are another. 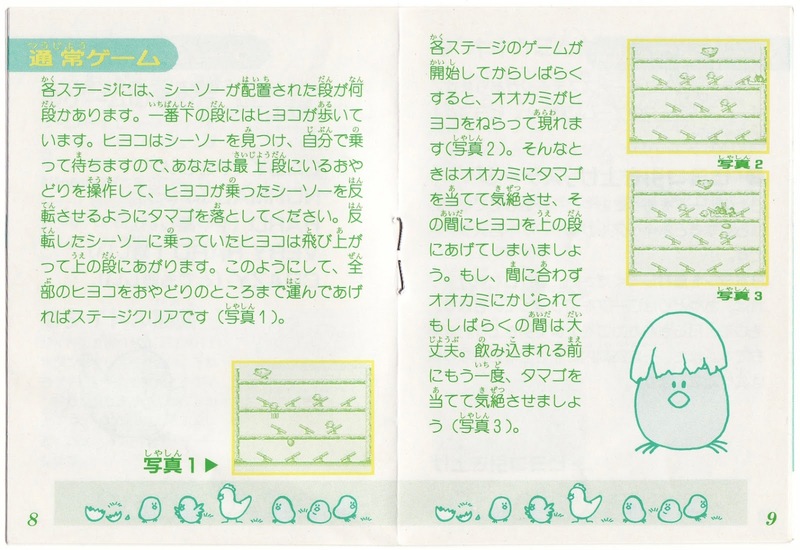 I'm also pretty fond of the Peetan manual's overall color scheme, although it can make scans such as the ones showcased in this post somewhat hard to see. My advice: click on them to blow them up a bit--or a lot. That'll make them far easier to enjoy. 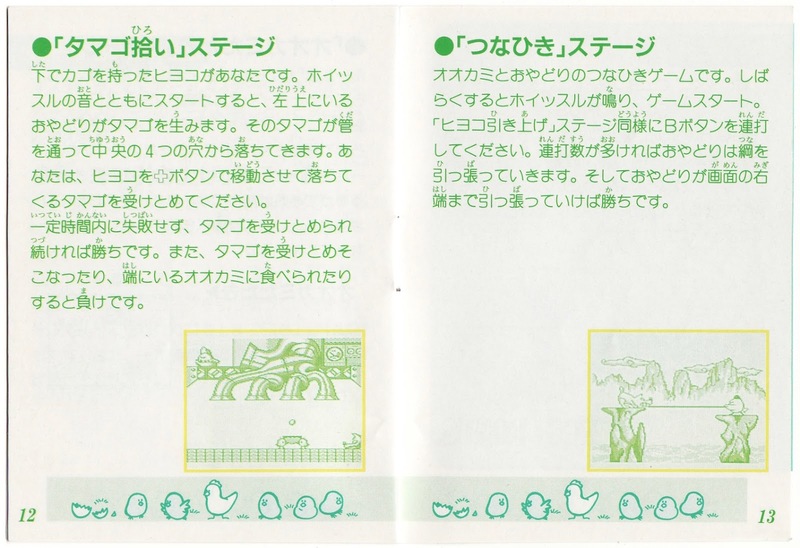 Something else I love about the Peetan manual: the wonky screenshots that are scattered throughout its 15 pages. 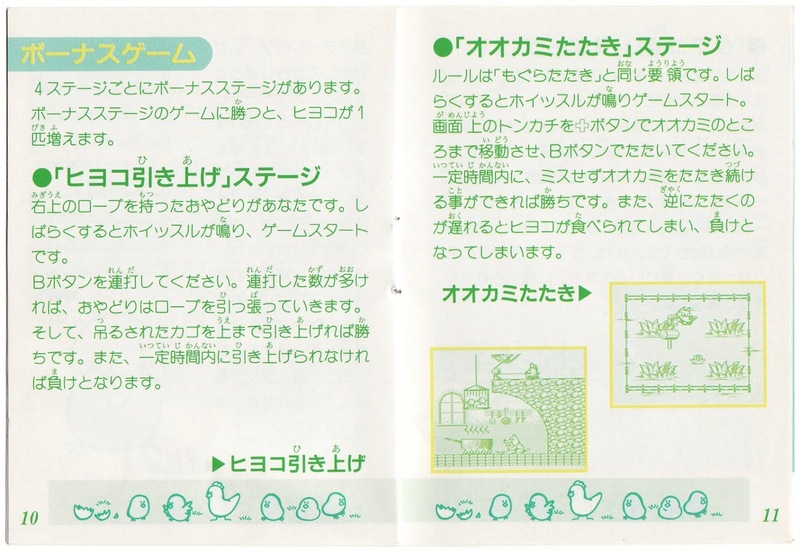 That's nothing new to the world of GameBoy instruction booklets, of course. 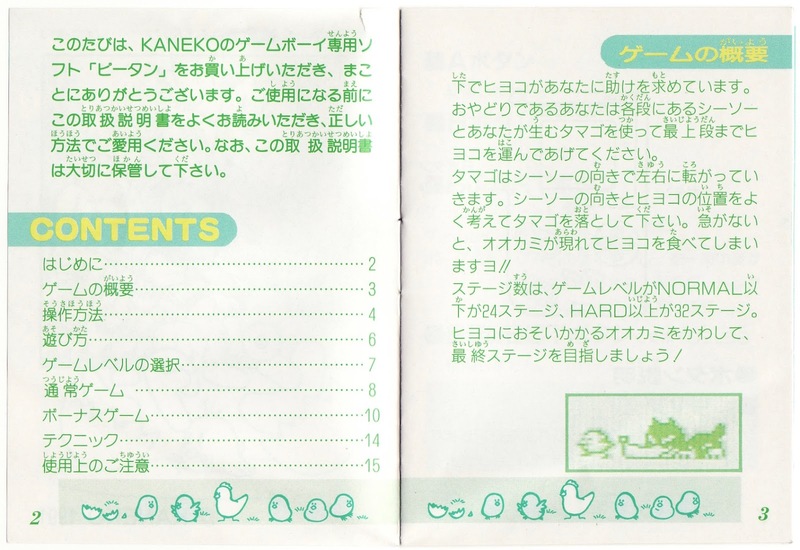 Most of them feature at least a few screenshots that could, at best, be described as fuzzy or hazy. Oh, well. Not every Japanese GameBoy manual can be as eye-popping as the ones made for Bubble Bobble Junior, Pitman, Snow Bros. Jr., or Totsugeki! 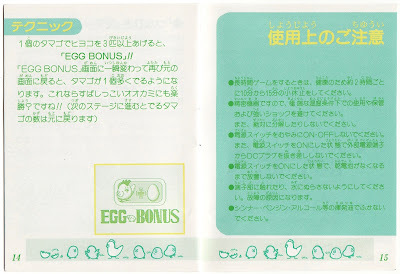 Ponkotsu Tank, right? Plus, Peetan's booklet includes something not found in any of the just-mentioned ones: an entire page about something called an "EGG BONUS."